Berlin, Germany – 17 June 2014. The invention of the QR Code has earned Masahiro Hara and his team members Takayuki Nagaya, Motoaki Watabe, Tadao Nojiri, and Yuji Uchiyama the European Inventor Award 2014 in the Popular Prize category. The European Inventor Awardis presented every year by the European Patent Office (EPO) in five different award categories to outstanding inventors. 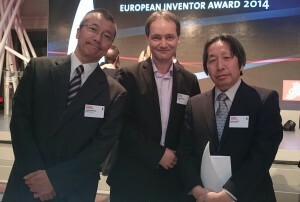 Laurent Tonnelier (mobiLead) between Takayuki Nagaya (DENSO Wave) and Masahiro Hara (DENSO Wave) at European Inventor Award in Berlin, Germany. In addition, the EPO also awards a Popular Prize on the basis of the results of an online voting competition among the public, whereas the laureates in the other categories are selected by the European Inventor Award jury. Voters could choose their favorite inventor from all 15 finalists selected for the European Inventor Award. Although there have been Japanese nominees in earlier years (2007 and 2009), Mr Hara is the first Japanese winner in the nine-year history of the European Inventor Award. Obtaining nearly 30% of the more than 20.000 online votes cast, hereceived Europe’s “Oscar” for innovation and technology today at a ceremony in Berlin, attended by some 500 international guests. 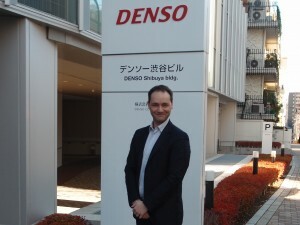 Laurent Tonnelier (mobiLead) at DENSO Wave HQ in Tokyo, Japan in December 2012. What started as an attempt to improve his employer’s logistics system ended up revolutionizing the world of the barcode. Hara’s black-and-white squares are now a common site on billboards and product packaging around the world. They create a link between the physical world and its virtual counterpart; the codes can be read anywhere and anytime, providing access to multimedia content. In 1974, a pack of gum with the world’s first barcode exchanged hands over a store counter. Today, nearly five billion universal product codes (UPCs) are scanned every day around the world in retail sales. Nonetheless, these familiar black-and-white stripes, which are also frequently used outside of retail, contain no more than 20 alphanumerical characters and their combination options are limited. This restriction had to be surmounted to meet the requirements of an increasingly advanced information age. Then, the problem found a solution: a team from the automotive supplier Denso Wave, a subsidiary of Toyota, developed a two-dimensional barcode in a project led by Masahiro Hara. The process lasted two years until the developers publically unveiled the now familiar square. At first, it was used exclusively to improve component tracking in automotive production – thus enhancing both efficiency and quality assurance. The inventor explains: “In contrast to linear barcodes, matrix barcodes contain both horizontal and vertical information – up to 350 times more data.” The 2D or “matrix” barcode not only offered more combination possibilities and a better data capture option than conventional UPCs, it could also be scanned faster and more efficiently. The QR Code was born. Quick response (QR) codes are square in form and contain special patterns related to the object or item they describe. Scanners use these patterns to retrieve and assess code information twenty times faster than with UPCs. The QR Code conveys information based on the arrangement of black and white elements in rows and columns. Every dark or light component represents a specific instance of binary code, which stands for a 0 or 1. QR Codes can be used to read approximately 7,000 numeric characters, as well as alphabetical characters, symbols, Japanese, Chinese or Korean characters, and binary data. In addition to item-related patterns and data, the codes contain an error correction pattern to correct distortions. An empty space or “quiet zone” frames the code and ensures that surrounding markings are not mistakenly interpreted as code. From managing factory inventory and patient records to tracking biological samples, getting passengers from A to B with tickets and boarding cards, or as marketing instruments or informational aids in museums – Masahiro Hara’s invention has become an integral part of our daily lives. It only requires a smartphone and an app to link the physical world with its virtual counterpart: scanning a QR Code launches a webpage, a geographical location or a text message.